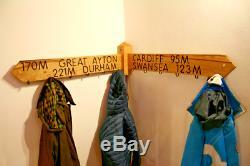 The Corner coat hanger can have up to 48 characters including spaces, don't forget to send. A message with the writing that you would like me to engrave. 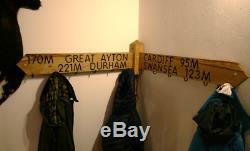 My rustic Corner sign coat hanger has 10 hangers that are spread apart and strong enough to hold multiple damp coats. Each coat hanger has it's own natural features which are enhanced with several courses of sanding and an oil based finish. The solid oak coat hanger has been built in the same way as the common coastal footpath signs which can withstand decades of our wet English weather. Bespoke and made to order, my personalised solid oak coat rack will fit nicely into that unused corner of the room. Made from hand picked solid oak with lots of character and strength. Rustic or Light Oak, the corner sign coat hanger has 10 hangers that are spread apart and strong enough to hold multiple damp coats. The coat hanger is extremely strong and should therefore be screwed into solid wood or solid walls using the plugs provided. It can be drilled into a stud wall but either find a beam or use very large stud wall plugs. 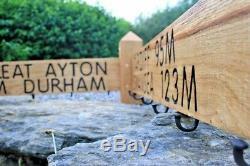 Personalise your sign with any word that is 12 characters long or less. The first 12 characters can fit on the top line and the second 12 characters will go underneath. Or simply have a small 12 character set of words in the middle. Some letters are smaller than others so please do contact me as sometime I can fit 18 characters on a single line. If you select rustic oak then I will use more characterful pieces of oak with knots and unique grain patterns. If you select light oak then I will use lighter pieces of oak with a smarter more flowing grain pattern. The best sandy beach you've been to. The house you grew up in. A place you want to remember. A date you met your other half. A county you want to visit. A school you went to. The university you graduated in. Please contact me before purchasing a smaller size as the lettering might not fit. The Corner coat rack comes with all of the fittings that you should need along with a instillation guide. The coat rack should be secured using two screws on each end of the points, and one in the middle. This makes it extremely strong and sturdy, the screws are hidden by dowels causing it to have a floating style. The coat rack will need to be put together on arrival, this involves hitting a wooden dowel into a hole once aligned. Length- From point to point the sign measures 152 cm. Height- From bottom of post to tip the sign measures 31 cm. Width- From face to the wall mounts the sign measures 10 cm. The nature of using Oak. 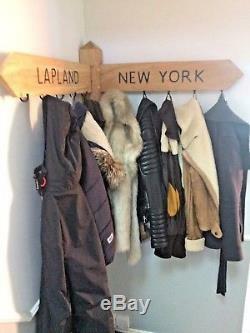 My coat racks are made using wood from a local saw mill, the Oak is fresh (green wood) which adds to its character. Over time Oak moves and cracks could appear, this really adds to the look and feel of the oak and because of its natural strength the cracks hardly weaken the wood. If anything Is wrong with the order then you will be either phoned or emailed the same day and I will help with the order and personalisation. The item "Corner Coat Rack, Solid Oak, Corner coat hanger, wall mounted coat rack, Bespoke" is in sale since Wednesday, November 22, 2017. This item is in the category "Home, Furniture & DIY\Storage Solutions\Wall Hooks & Door Hangers". The seller is "graindesignsuk" and is located in Kingsbridge.